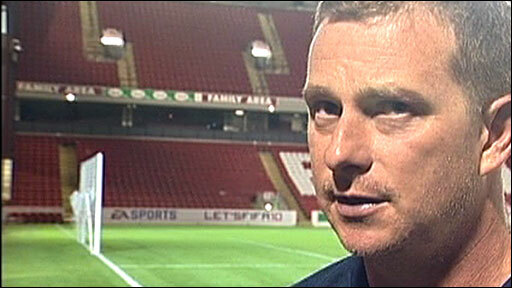 Hugo Colace scored the winner as Barnsley knocked last year's semi-finalists out of the Carling Cup. Steven Fletcher's powerful shot put Burnley ahead on 21 minutes after he controlled Brian Jensen's long ball. 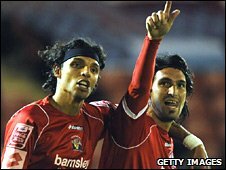 Barnsley levelled a minute later when Jon Macken scored from close range and they were ahead at half-time thanks to Anderson da Silva's 25-yard screamer. Chris Eagles equalised after superb work from Fernando Guerrero but Colace sealed it from De Silva's cross. The result, the first time Barnsley have reached the fourth round in 10 years, continues an impressive start to Mark Robins' reign as Tykes boss. Robins, whose Rotherham side knocked Derby out of the Carling Cup in the first round, has overseen a run of four points in three games since arriving at the struggling Championship club. Burnley boss Owen Coyle has also received rave reviews for the Clarets' start to life in the Premier League. He made six changes to his side for the trip to Oakwell - and had to make two first-half substitutions. Martin Paterson was carried off on a stretcher to be replaced by Jay Rodriguez, while substitute keeper Diego Penny was also called into action after an injury to Jensen. That led to eight minutes of first-half injury time and in the sixth, Da Silva lit up the game with a stunning finish into the top corner to put Burnley 2-1 ahead at the break. Guerrero's pace caused the hosts problems all night and his brilliant run, leaving Kozluk in his wake, allowed Eagles the simplest of finishes. But Barnsley had the final word, Colace heading into the top corner from Da Silva's pinpoint cross. 90:00+4:33 The referee brings the game to a close. 90:00+4:06 Shot on goal by Fernando Guerrero from just inside the area goes over the target. 90:00+3:01 Free kick awarded for an unfair challenge on Iain Hume by Andre Bikey. Iain Hume takes the free kick. 90:00+1:52 Free kick awarded for a foul by Chris Eagles on Anderson De Silva. Free kick taken by David Preece. 90:00+1:09 Chris Eagles takes a inswinging corner from the left by-line to the near post, Hugo Colace manages to make a clearance. 90:00+0:56 Corner from the right by-line taken by Chris Eagles, clearance by Stephen Foster. 89:55 Free kick awarded for an unfair challenge on Chris Eagles by Hugo Colace. Steven Fletcher produces a strike on goal direct from the free kick, save by David Preece. 89:21 Shot by Iain Hume from just outside the area goes over the net. 88:51 Jonathan Macken takes a shot. Save by Diego Penny. 88:04 Unfair challenge on Kevin McDonald by Jacob Butterfield results in a free kick. Direct strike on goal from the free kick comes in from Chris Eagles. 86:21 Shot on goal by Fernando Guerrero from just inside the area clears the crossbar. 84:46 Corner taken by Chris Eagles from the left by-line, Clarke Carlisle takes a shot. Save by David Preece. 83:44 O'Neil Thompson fouled by Jay Rodriguez, the ref awards a free kick. Free kick taken by O'Neil Thompson. 83:16 Effort on goal by Anderson De Silva from a long way out goes over the bar. 81:30 Chris Eagles takes a shot. Save made by David Preece. 79:14 Chris Eagles takes the inswinging corner, Headed effort from deep inside the area by Andre Bikey misses to the right of the target. 79:00 Steven Fletcher takes a shot. Save by David Preece. 78:32 Hugo Colace takes a shot. Diego Penny makes a save. 77:36 Corner taken right-footed by Chris Eagles from the right by-line to the near post, clearance by Hugo Colace. 76:41 Inswinging corner taken right-footed by Iain Hume from the left by-line, clearance made by Andre Bikey. 75:53 Iain Hume fires a strike on goal direct from the free kick, save by Diego Penny. 75:53 Booking Michael Duff booked for unsporting behaviour. 75:47 Free kick awarded for a foul by Michael Duff on Adam Hammill. 74:01 Assist on the goal came from Anderson De Silva. 74:01 GOAL - Hugo Colace:Barnsley 3 - 2 Burnley Hugo Colace scores a headed goal from deep inside the penalty area. Barnsley 3-2 Burnley. 73:20 Joey Gudjonsson fouled by Jacob Butterfield, the ref awards a free kick. Free kick taken by Andre Bikey. 72:10 Jonathan Macken gives away a free kick for an unfair challenge on Clarke Carlisle. Direct free kick taken by Diego Penny. 71:21 Free kick awarded for an unfair challenge on Adam Hammill by Michael Duff. Iain Hume crosses the ball from the free kick right-footed from left channel, Jay Rodriguez makes a clearance. 69:57 Corner from right by-line taken by Iain Hume. 68:41 Shot by Jonathan Macken from outside the box goes high over the target. 67:53 Unfair challenge on Fernando Guerrero by Iain Hume results in a free kick. Direct free kick taken by Diego Penny. 67:16 Foul by Andre Bikey on Jonathan Macken, free kick awarded. Free kick crossed by Jacob Butterfield, Michael Duff manages to make a clearance. 62:58 Effort from the edge of the box by Iain Hume goes wide of the left-hand post. 62:31 Steven Fletcher concedes a free kick for a foul on O'Neil Thompson. David Preece restarts play with the free kick. 62:01 Chris Eagles takes a shot. Save by David Preece. 60:59 Chris Eagles delivers the ball from the free kick right-footed from left wing, clearance by O'Neil Thompson. 60:59 Booking Caution for Stephen Foster. 60:36 Foul by Stephen Foster on Steven Fletcher, free kick awarded. 59:50 Free kick awarded for a foul by Michael Duff on Adam Hammill. Julian Gray takes the direct free kick. 59:16 Effort on goal by Julian Gray from outside the box goes harmlessly over the bar. 58:50 Outswinging corner taken from the right by-line by Iain Hume, save by Diego Penny. 58:24 Corner taken by Iain Hume played to the near post, clearance made by Joey Gudjonsson. 57:47 Christian Kalvenes is penalised for a handball. Iain Hume delivers the ball from the free kick right-footed from right wing, Clarke Carlisle manages to make a clearance. 56:28 Corner taken right-footed by Chris Eagles from the left by-line, Header from deep inside the area by Clarke Carlisle goes harmlessly over the crossbar. 53:58 Unfair challenge on Andre Bikey by Jonathan Macken results in a free kick. Andre Bikey takes the direct free kick. 52:03 Handball decision goes against Fernando Guerrero. Iain Hume delivers the ball from the free kick right-footed from right wing, clearance by Clarke Carlisle. 51:09 The assist for the goal came from Fernando Guerrero. 51:09 GOAL - Chris Eagles:Barnsley 2 - 2 Burnley A goal is scored by Chris Eagles from close in to the bottom right corner of the goal. Barnsley 2-2 Burnley. 45:42 Iain Hume takes a shot. Save by Diego Penny. 45:01 Substitution Michael Duff replaces Richard Eckersley. 45:01 Substitution (Barnsley) makes a substitution, with O'Neil Thompson coming on for Darren Moore. 45:00+8:05 It is the end of the first-half. 45:00+6:42 GOAL - Anderson De Silva:Barnsley 2 - 1 Burnley Anderson De Silva scores a goal from outside the penalty area to the top right corner of the goal. Barnsley 2-1 Burnley. 45:00+5:13 Jonathan Macken fouled by Andre Bikey, the ref awards a free kick. Free kick crossed right-footed by Iain Hume, Diego Penny makes a save. 45:00+4:23 Kevin McDonald gives away a free kick for an unfair challenge on Jacob Butterfield. Free kick taken by Jacob Butterfield. 45:00+3:58 Chris Eagles takes the outswinging corner, Hugo Colace manages to make a clearance. 45:00+2:11 The assistant referee flags for offside against Chris Eagles. Stephen Foster takes the free kick. 45:00+0:59 Adam Hammill fouled by Richard Eckersley, the ref awards a free kick. Free kick crossed right-footed by Iain Hume from left channel, Andre Bikey manages to make a clearance. 43:57 The ball is crossed by Julian Gray. Correction - 43:26 Unfair challenge on Jonathan Macken by Andre Bikey results in a free kick. Robert Kozluk takes the free kick. Robert Kozluk crosses the ball. 42:56 Chris Eagles is ruled offside. Indirect free kick taken by David Preece. 41:54 Anderson De Silva has an effort at goal from deep inside the area missing to the right of the goal. 40:58 Iain Hume is flagged offside by the assistant referee. Free kick taken by Diego Penny. 40:02 Inswinging corner taken right-footed by Iain Hume from the left by-line, Clarke Carlisle manages to make a clearance. 38:55 Anderson De Silva is caught offside. Free kick taken by Diego Penny. 35:13 The offside flag is raised against Iain Hume. Diego Penny takes the indirect free kick. 34:46 Free kick awarded for an unfair challenge on Robert Kozluk by Steven Fletcher. Free kick taken by David Preece. 33:49 Substitution Diego Penny joins the action as a substitute, replacing Brian Jensen. 28:55 The free kick is delivered right-footed by Iain Hume from left wing, save by Brian Jensen. 28:55 Booking Richard Eckersley goes into the referee's book for unsporting behaviour. 28:50 Foul by Richard Eckersley on Adam Hammill, free kick awarded. 27:58 Shot on goal by Fernando Guerrero from just inside the area clears the crossbar. 26:24 Jacob Butterfield challenges Richard Eckersley unfairly and gives away a free kick. Free kick crossed right-footed by Chris Eagles from right wing, clearance made by Stephen Foster. 25:45 The assistant referee flags for offside against Jonathan Macken. Indirect free kick taken by Brian Jensen. 25:19 Chris Eagles takes a shot. David Preece makes a save. 23:17 Unfair challenge on Anderson De Silva by Christian Kalvenes results in a free kick. Iain Hume crosses the ball from the free kick right-footed from right channel. 22:58 Richard Eckersley is penalised for a handball. Free kick taken by Iain Hume. 22:24 Unfair challenge on Richard Eckersley by Jonathan Macken results in a free kick. Joey Gudjonsson crosses the ball from the free kick right-footed from right wing, clearance by Jonathan Macken. 21:43 Assist by Iain Hume. 21:43 GOAL - Jonathan Macken:Barnsley 1 - 1 Burnley A goal is scored by Jonathan Macken from close range to the top right corner of the goal. Barnsley 1-1 Burnley. 20:15 GOAL - Steven Fletcher:Barnsley 0 - 1 Burnley Steven Fletcher scores a goal from outside the penalty box to the bottom right corner of the goal. 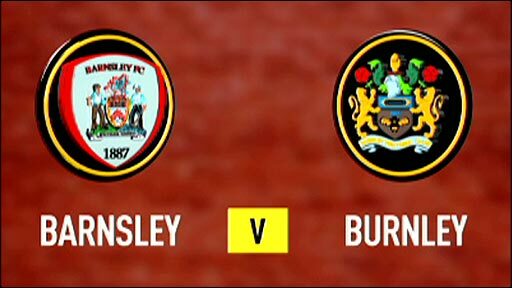 Barnsley 0-1 Burnley. 17:57 Darren Moore challenges Steven Fletcher unfairly and gives away a free kick. Clarke Carlisle restarts play with the free kick. 17:26 Chris Eagles produces a right-footed shot from the edge of the area and misses to the left of the target. 15:59 Short corner worked by Fernando Guerrero. Correction - 15:33 Chris Eagles takes a shot. Save by David Preece. 15:33 Chris Eagles takes a shot. Save made by David Preece. 14:48 Substitution Jay Rodriguez is brought on as a substitute for Martin Paterson. 12:19 Foul by Christian Kalvenes on Robert Kozluk, free kick awarded. Direct free kick taken by Stephen Foster. 10:42 Corner taken by Chris Eagles, Robert Kozluk makes a clearance. 10:18 Outswinging corner taken by Chris Eagles, Jonathan Macken manages to make a clearance. 9:53 Corner taken left-footed by Chris Eagles to the near post, Steven Fletcher takes a shot. Blocked by Robert Kozluk. 9:38 Fernando Guerrero takes a shot. Blocked by Darren Moore. 7:52 Iain Hume sends in a cross, Brian Jensen makes a save. 7:12 Corner taken right-footed by Iain Hume, Clarke Carlisle manages to make a clearance. 6:19 Free kick awarded for a foul by Hugo Colace on Fernando Guerrero. Joey Gudjonsson takes the free kick. 5:10 Clarke Carlisle challenges Iain Hume unfairly and gives away a free kick. Direct free kick taken by Jacob Butterfield. Correction - 2:46 Outswinging corner taken by Iain Hume, Steven Fletcher makes a clearance. 2:46 Outswinging corner taken left-footed by Iain Hume, Steven Fletcher manages to make a clearance. 0:35 Christian Kalvenes fouled by Iain Hume, the ref awards a free kick. Free kick taken by Kevin McDonald.